What do we do? – We spread the news about your celebration! Whether it’s a new baby in the family or someone’s birthday, we want the world to know about your loved one’s special day. Our services include personalized yard greetings, personalized chocolate wrappers, gift baskets, and many more to come! Why we do it – We grew up in a family where you did anything and everything for the people you love, ESPECIALLY family. We know that many other people feel the same way. We have many loved ones of our own, and we would do anything to make them happy. Join us, won’t you? Celebrating special occasions is what we love doing. It’s also what we do best! We are driven by the idea that we can make you and your family happy. You won’t see our artwork anywhere else! We’re not in the business of selling party favors. We’re here to celebrate life by creating the most beautiful designs as humanly possible. From raising children in our own families, we know how great it feels to see a kid’s smile light up. The things that make our customers happy define everything we do. 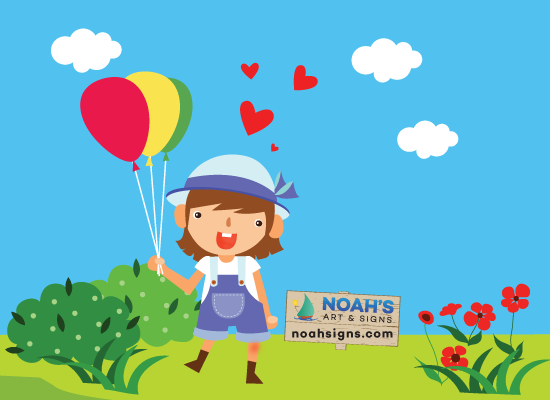 Noah’s Art & Signs is continuously innovating with new design ideas. We’re always hungry for new inspiration to make sure we can offer the best products available. This has been the best service I’ve gotten in a long time. Great communication and product is key. And you guys have it! You guys have definitely gained a loyal customer. Very nice and big and colorful, looked great in the yard. Made of plastic with bright colors and metal inserts to stand it in the lawn. easy to put together. These custom cut signs are nice, my wife loved them. Its a great way to announce that you've just had a baby. They are firm and well made, so they withstand the weather very well. I recommend this yard sign as a great way to let your neighbors know a new baby has arrived! Better than some cardboard or a small sign, huge, and very impressive. LOOKS like a big deal! YOU CANT GO WRONG, surprised my daughter and son in law with it when they arrived home and WOW !! NO ONE driving by your house will MISS IT and there was NO PROBLEM with rainy weather!!!! Not even in 25 mph gusts did it blew away once, of course no big deal under normal conditions. I have been looking around for some great announcements for my baby shower welcoming my first son. These signs were so easy to order, it took no time to complete the order by computer. I didn't use the extra balloons as it did not actually go along with the shower colors. But everything else worked out great!! Ready to make someone smile?